Late last year the Skipper Canteen opened at Magic Kingdom's Adventureland, a move which this author enthusiastically endorsed. Yet not everyone was as complimentary as I - almost immediately unfavorable comparisons to the Adventurer's Club of Pleasure Island began to emerge. 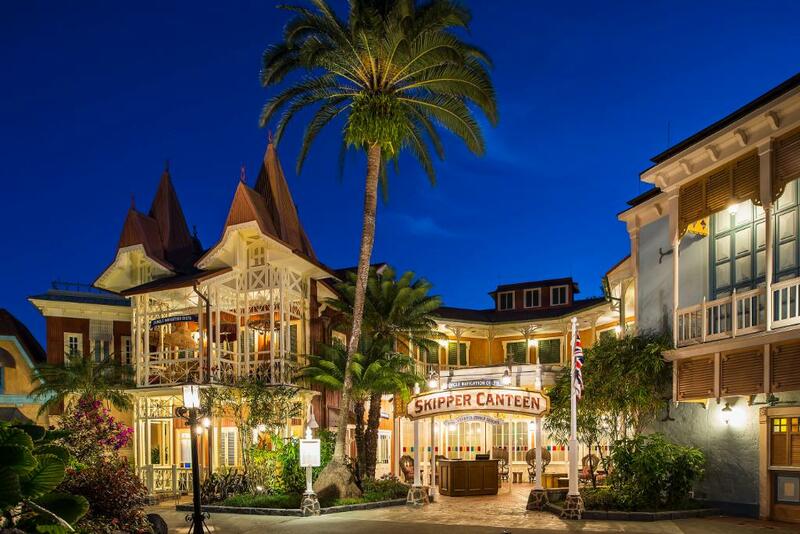 In fact, 2015 was something of a bumper crop year for restaurants being unfavorably compared to the Adventurer's Club, starting with the new Trader Sam's in the Spring, proceeding through Jock Lindsay's Hangar Bar in the Fall, and climaxing with Skipper Canteen in the Winter. This is in spite of the fact that none of these restaurants - to a one - ever announced or attempted any ties to that loudly missed Pleasure Island institution. 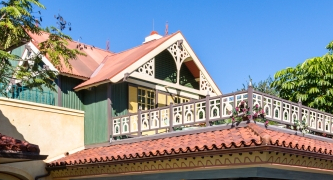 Between Summer 1994 and Winter 2015, an entire generation has passed through Adventureland without stepping foot into the Adventureland Veranda. Pieces of the original layout have been truncated, altered, and removed over time - the shaded verandas which gave the food service location its name did not return, and the most extended seating porches out towards the Breezeway had long been swallowed up by Restrooms. And so it is entirely reasonable to expect new visitors to not be fully in the know about exactly what the Adventureland Veranda and the Skipper Canteen represents and, in looking for answers, perhaps did not look to the right places to begin with. Adventurer's Club belonged to some time long ago, where there could still theoretically be snooty butlers and French maids. The time period of both the Jungle Cruise and the Club are some ephemeral sense of "pre-World War II"; back then, when theoretically we could expect Indiana Jones, Rick Blaine, or Groucho's Captain Spaulding persona to rub shoulders at the bar. A time that didn't really exist, but generations of passed on memories from Hollywood thrillers made us want to believe it could have. And of course, the Jungle Navigation Company - the fictional proprietors of the Jungle Cruise - were explicitly connected to the Adventurer's Club. 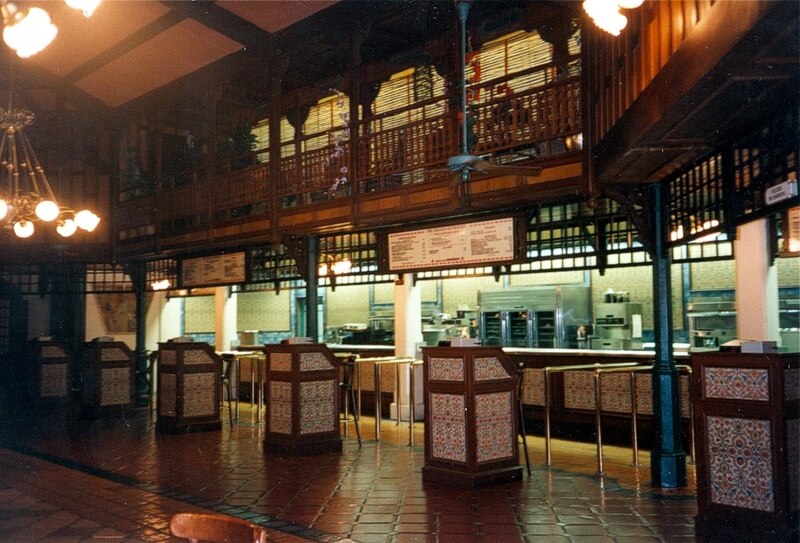 Many guests seemingly expected the Canteen to reflect either the Club, which was connected to the Jungle Cruise mythologically, or the Jungle Cruise queue area, connected to the Jungle Cruise physically. Instead, they were served up, in Skipper Canteen, a remade version of something else entirely. 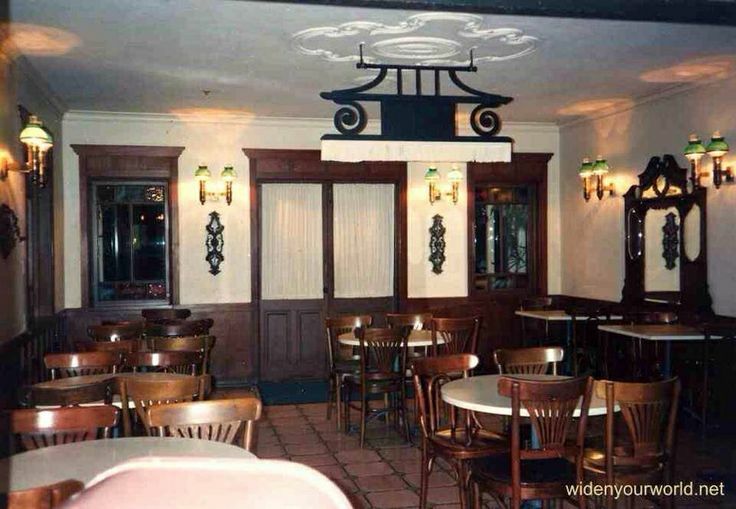 And don't get me wrong; I applaud Magic Kingdom's decision to honor the original design of the Adventureland Veranda, one of the most richly evocative spaces ever created for a theme park. The trick is, it's been so long that most people aren't even sure what the Veranda was designed to evoke, so to show how retaining the interior makes both good historical and thematic sense, we need to grapple with what the Veranda is supposed to be at all. As described in a previous post, Adventureland at Magic Kingdom does follow a specific progression and trace a unified concept, it's just one most observers will never attempt to unpack. We will have to, for the purposes of this essay. There are basically four sections to Adventureland, and each structure can be tied to one or another. 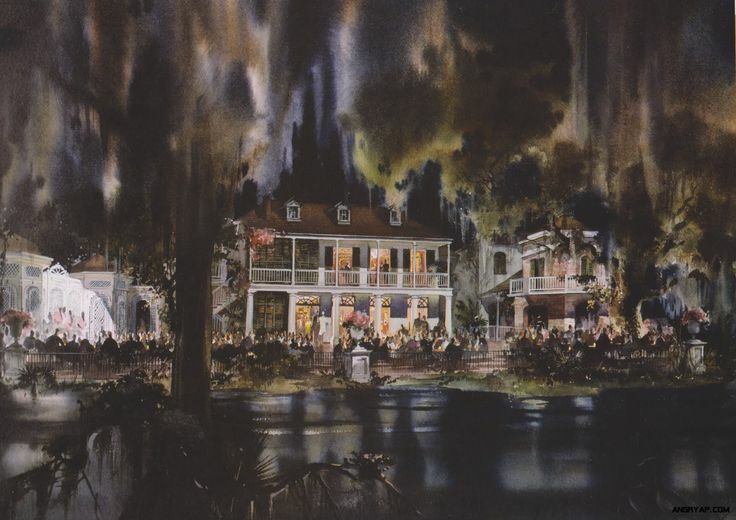 The Theme of Adventureland is of the encounter between the Western world and far-off places and peoples. This Theme is Visualized through the device of exotic architecture. 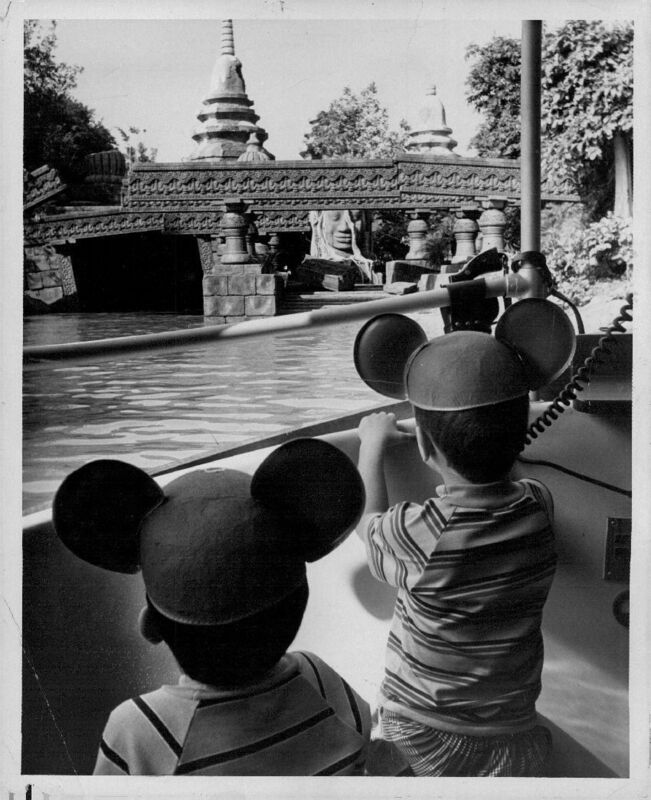 The Thematic Heart of the area is the Jungle Cruise, the ride the area was designed to complement, where we (modern Americans) may travel into uncharted regions and confront various dangers. 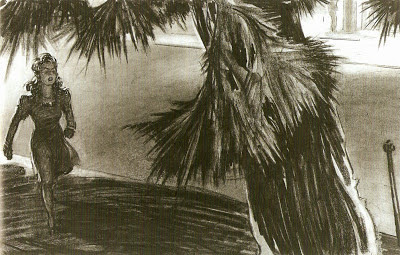 The First Section is the Jungle. The Jungle represents the untamed wilderness which Adventureland encroaches on. Attractions that belong to the Jungle are the Jungle Cruise and the Swiss Family Treehouse, both representing the concept of "Survival Against the Odds". Both attractions are perched on the edge of the apparently boundless Jungle section. The Thematic Heart of the Jungle Section is the Cambodian Ruins, which represents the notion that all cultures will fail to conquer the wilds of the Jungle and establishes the dominance of this threat. The Second Section is the Colonial Area. 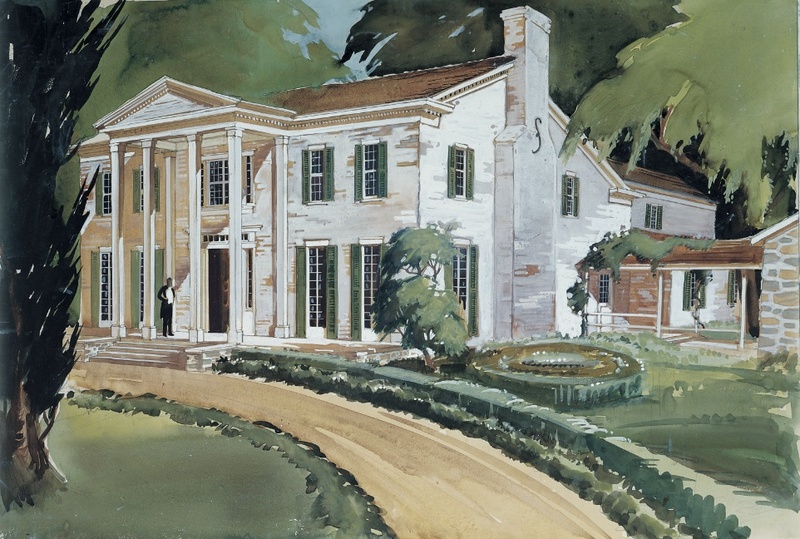 The Colonists represent the intrusion of Western cultures into forgein lands. 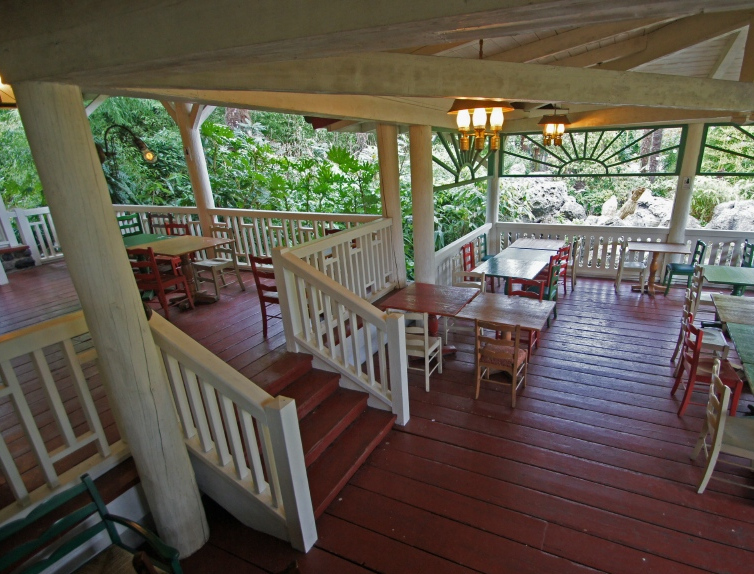 The Thematic Heart of the Colonial Section is the Adventureland Veranda. 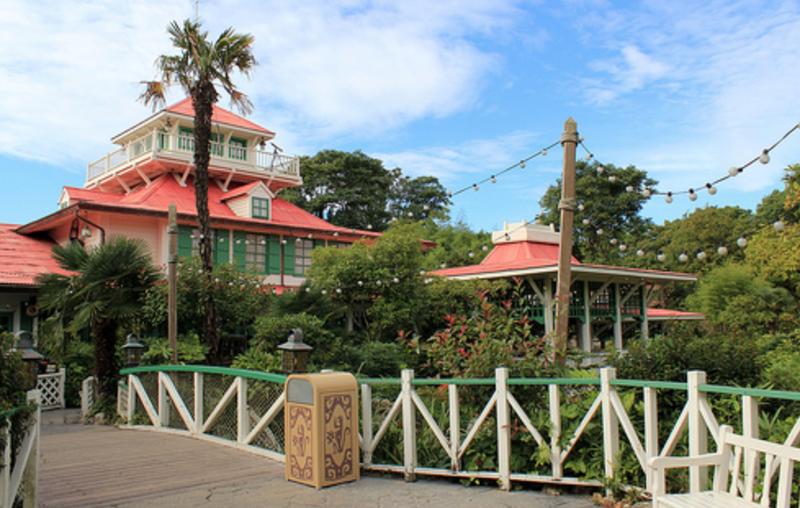 Notice how, when entering from the Hub, that the Colonial Section is directly juxtaposed with the Jungle across the way, an early indication of the main conflict of the area - and setting up the nearby Jungle Cruise. The Third Section is what I call the Native Section. 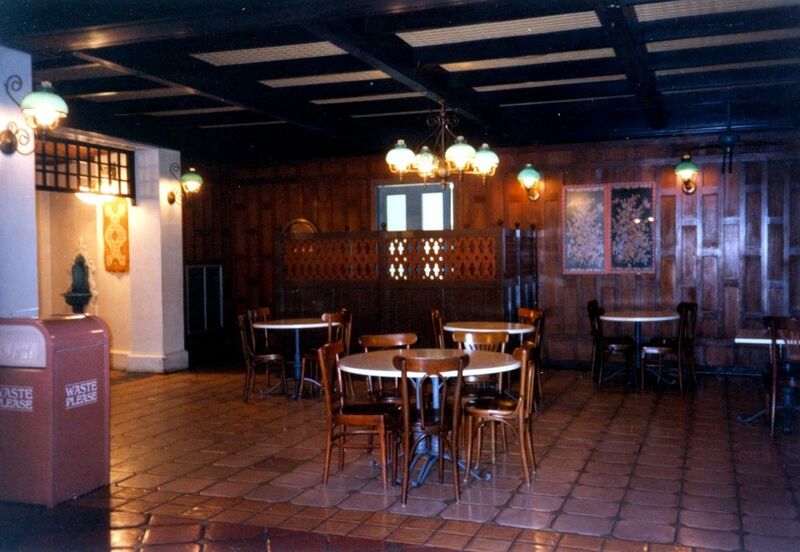 The transition occurs at the Adventureland Breezeway where the bathrooms are located, where the architecture switches to rougher earthen walls and strong Moorish influences. This is the civilization which existed in Adventureland before the Colonists arrived, and it appropriately is positioned further in the area, allowing the Victorian touches of the Colonial section and Main Street U.S.A. to transition smoothly. 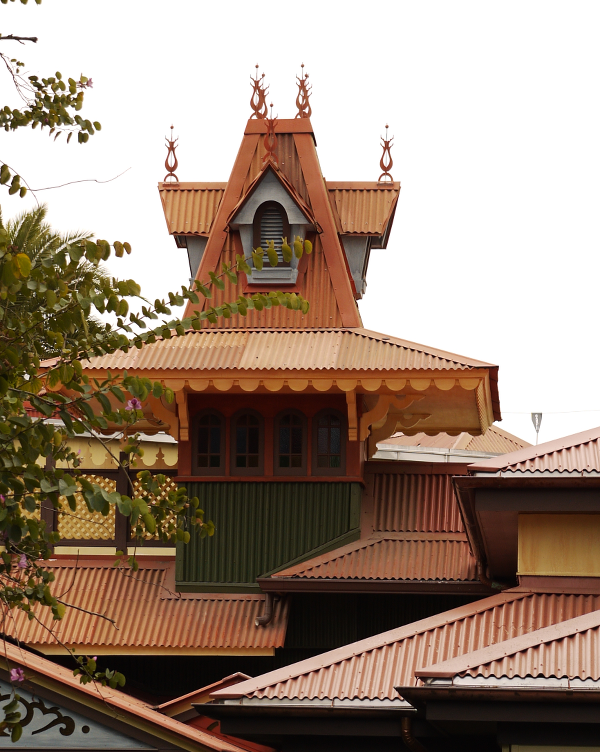 The Thematic Heart of the Native Section is the Balinese Temple that the Enchanted Tiki Room occurs in. 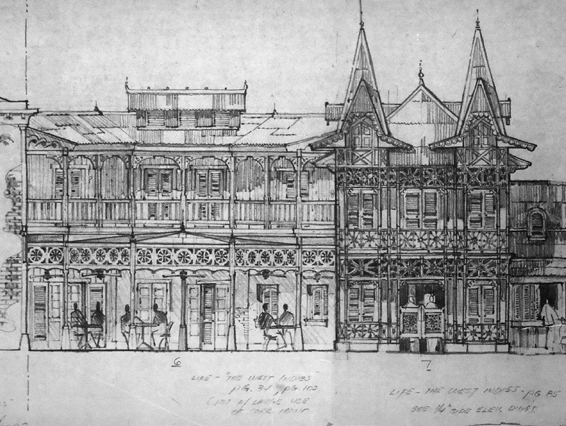 Let's dwell for a moment on the altered significance of the Tiki Room at Magic Kingdom. At Disneyland, the Tiki Room is designed to reflect a midcentury American tiki restaurant, the likes of which had proliferated across Southern California since the end of the war. That's why it's supposed to be a surprise when the stuffed birds inside come to life. At Magic Kingdom, the Tiki Room is inside a Balinese Temple, an actual house of the Gods. We are told in the pre-show area that the Birds inside can talk as an effect of the "Magical Sunshine Pavilion", i.e. they can speak because they have been blessed by the power of the Gods. Therefore, when the Tiki Gods end the showing of American pop culture by bringing in a storm, it's an actual reflection of their power. In other words, we're lucky they didn't get even angrier. The Colonists don't stand a chance. Or, as Uhoah said, "When you mess with Polynesia, the Tiki Gods will squeeze ya!" The Fourth Section is Caribbean Plaza, which comprises Pirates of the Caribbean. The Thematic Heart of the Plaza is the Castillo del Morro, the fortress the pirates attack and overrun in the ride. But the Pirates are intruders as much as the Colonizing Spaniards are, don't forget. Although Pirates of the Caribbean does not dramatize Adventureland's key theme - it's a morality play and thus best paired with The Haunted Mansion - the fact that Caribbean Plaza is executed in Spanish Colonial style, and bookends the Native section of Adventureland with yet another village built by conquerors, both means it feels perfectly at home in Adventureland and allows for a smooth transition into a representation of another area overrun by greedy white men: Latin America and the American Southwest. 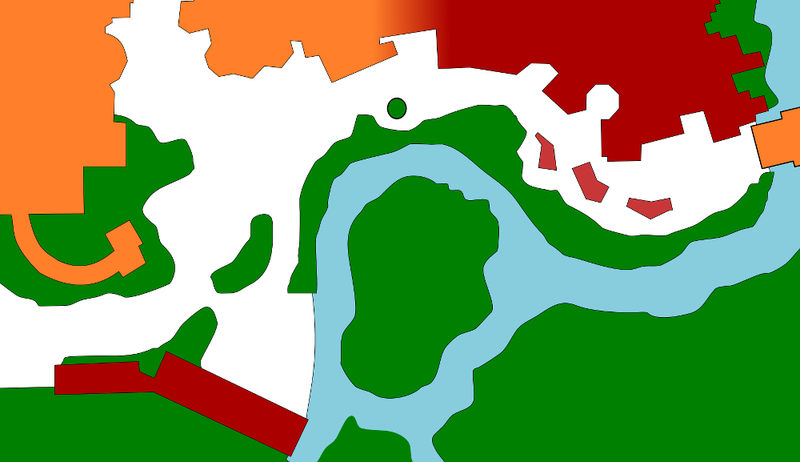 Here's a map of the main area with everything color coded to dramatize the clash of values in Adventureland. The Adventureland Veranda: What Is It? 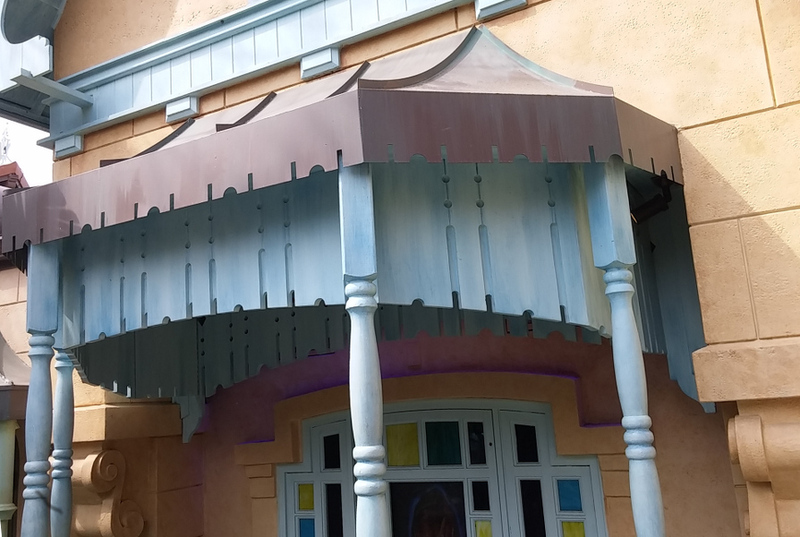 Okay, now that we know how the Veranda fits into the narrative conveyed by Adventureland's architecture, let's dig into what the darn thing actually is, and we can begin by taking a quick tour of what's represented architecturally here. 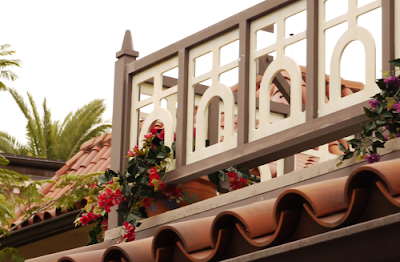 Facing the Hub, we see immediately tile-lined roofs and elaborately shaped details. 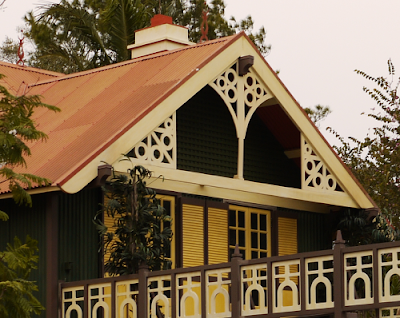 The elaborate scrollwork of the Veranda is unmistakably Victorian in design. We know this because only the Victorians did things like nail intricately scrolled wood on their houses, and they did it because it was brand spanking new and novel. The Scroll Saw that made the production of these pieces possible was not created until the Industrial Revolution, which meant you could now cheaply produce things which once would've required a skilled artisan. The Victorians loved that stuff, which is why we can instantly recognize the intricate but mass produced "gingerbread" of Main Street USA as Victorian. 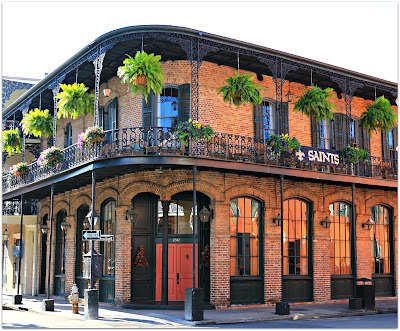 ...promenading balconies and painted steel or tin roofs. Corrugated steel, again, being a product of the Industrial Revolution, making it possible to date our structure definitively to late in the 19th century. But let's keep looking before we jump to any conclusions. It gets into tricky territory if you want to claim that Hawaii was ever "colonized" - issues that a Disney blog and this unlearned author would be best to avoid. 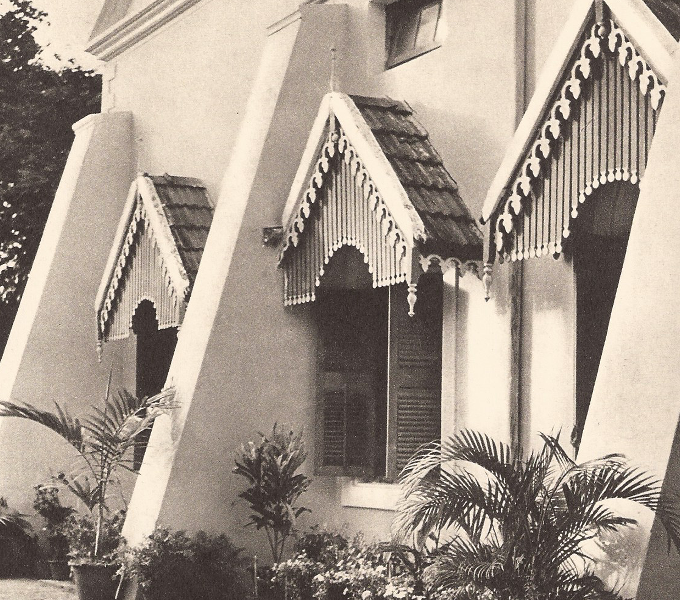 We are in the "Colonial Section", and if the more Asian the designs get the closer we seem to the Veranda, then we need to question which European powers maintain colonies in Asia. And when we ask that, the range narrows considerably: Britain and France. How about India? The entrance to the Veranda has this highly atmospheric punkah, redolent of tropical climes and the Indian subcontinent. Punkahs spread with the English out of British East India during their colonial era, spreading west to Europe. Keep in mind this connection, but next we have to look to French Indochina, and once we do that, things start to look familiar indeed. 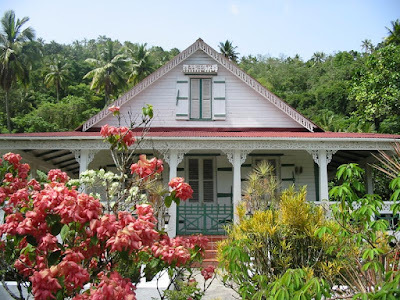 French Colonial architecture begins to more strongly resemble the almost hallucinatory refinement we see in Adventureland. 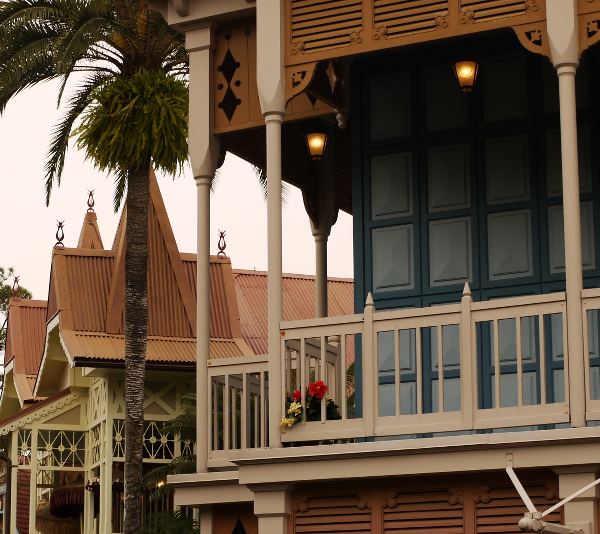 The rambling balcony on this house would look at home dispensing Dole Whips. Airy verandas, just as in the Old South... wait, the clue was actually in the name all along! Turns out the name "Adventureland Veranda" doesn't just describe the actual Verandas which lined the east side of the structure facing the Hub, but were meant to evoke the function of the space as a great house, a location of manners and refinement, a cool escape from the oppressive heat beyond. This not only makes the interior more strange and exotic, helping differentiate it from Main Street, but looks forward to the totally rustic look of the "Native Village" deeper in Adventureland, typified by the Tiki stylings of the Sunshine Pavilion and the Jungle Cruise. It's a testament to the design talents of WED Enterprises that generations of guests detected this without really being able to put their finger exactly on what it was they were seeing. French Colonial architecture is at once familiar and exotic, an appropriate overture to the area to come. It can look European, American, Caribbean, Indian and Asian all at once, and has been quietly confounding description for decades. 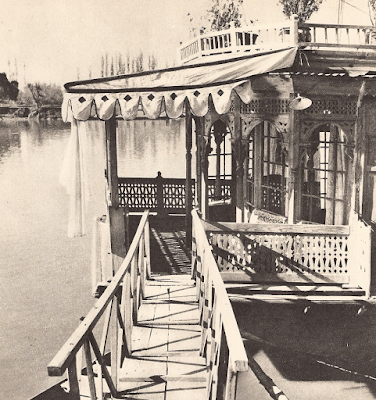 Once I had gathered the above sets of influences, I was able to start drilling down my search for material on the design of the Adventureland Veranda, and thanks to a fortuitous series of "finds", I'm able to present a fairly clear picture for the first time. So, it's time to meet Disney Legend Dorothea Redmond. Mrs. Redmond has been mentioned here before, but it's fair to say that if the design of Magic Kingdom had an "MVP", I'd place Dorothea at the top of the list. This may seem silly, until I start listing the locations based directly on her designs: The Crystal Palace, King Stephan's Banquet Hall, Liberty Tree Tavern, Plaza Restaurant, Tony's Town Square, Columbia Harbour House... need I go on? I've been able to gather up a number of Redmond's pieces relating to Magic Kingdom's Adventureland, which if I had to guess, based on what I have, she designed the common areas in totality. Don't worry, we'll get closer to pull it apart presently. I was, in fact, going to pass on this unremarked when I noticed that Redmond had left barely legible source citations at the bottom of her art, and this find was too remarkable to pass up on. 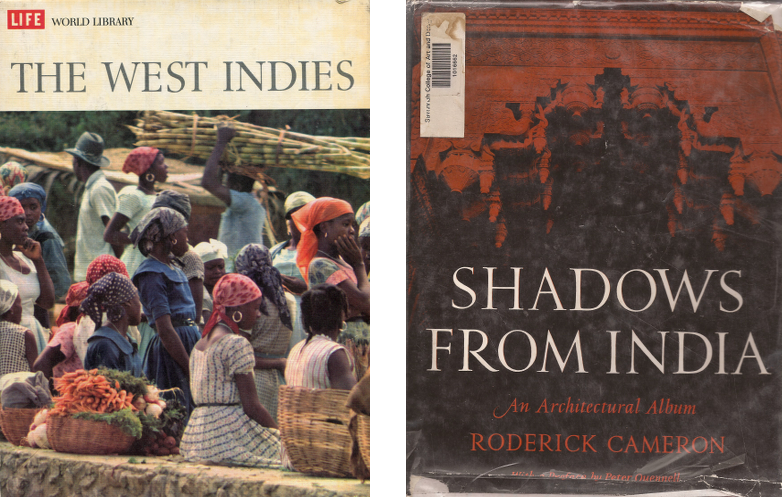 Although there were undoubtably other sources, I'm pleased to present two books which are direct sources for Magic Kingdom's Adventureland: The West Indies by Life World library, 1967, and Shadows From India by Roderick Cameron, 1958. 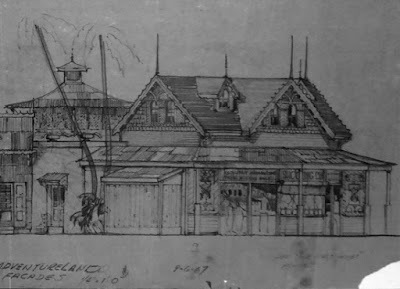 The final design was much reduced and had no visible structural decay, but that is definitely the building where Dole Whips were dispensed for three decades. Redmond's notation here directs us to Shadows From India page 135, which turns out is a fairly unenlightening reference for the windows seen here. It turns out this memorable building is actually a pretty direct copy of a house in Port-au-Prince, which at least as of 1967 was still standing. 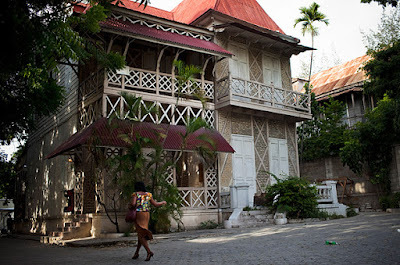 I've searched online and it no longer seems to exist - much of Port-au-Prince's Victorian architecture was either torn down or finally destroyed by the 2010 earthquake. But here's one, rarely bestowed form of immortality! Let's go back to the Adventurer's Club for a moment here. 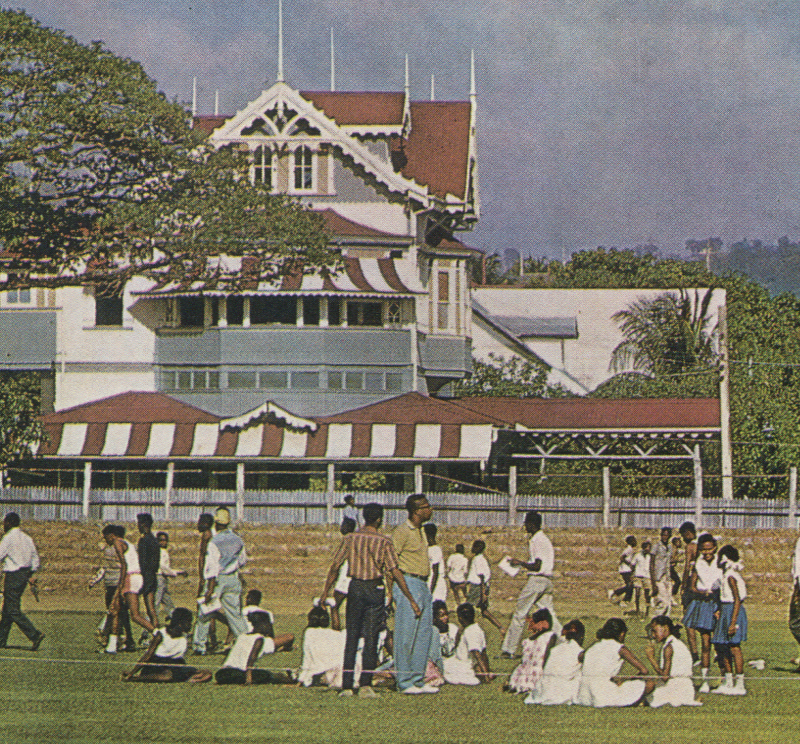 Here's the thing, even allowing for the inexact nature of farce, is that Adventurer's Club was always supposed to be a Gentleman's Club, heavily British East Indian in style. Supposedly the idea germinated from a theme party held by Joe Rhode in the late 80s called "The Last Days of the Raj". In other words the Adventurer's Club was a place you came back to to tell your stories and show off your treasures. 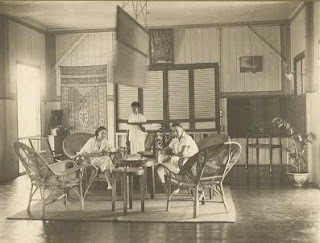 The Adventureland Veranda is a plantation, meaning it has the feeling not only of being away from everything, but of domesticity. Now the Jungle Cruise is unavoidably British Colonial in theme, even if it's staffed with wisecracking yanks in the fashion of Humphrey Bogart in The African Queen. Thus it makes sense that the Jungle Cruise and Adventurer's Club would be bedfellows. So how does the Jungle Cruise fit into the Veranda? I'd argue that there is a backdoor here through the colonialism theme. And since it would be egregious to keep the distinctive exterior of the Veranda structure but gut the interior to resemble something it is not, then either the whole thing must be torn down and rebuilt into an entirely new stretch of architecture or the Jungle Cruise theme must be adapted to the new space. 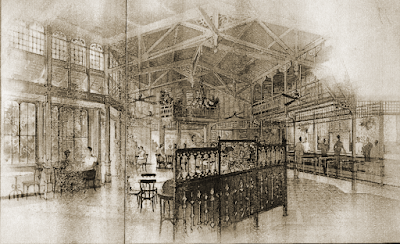 The key is that the Skipper Canteen must then by definition not be a social space in the style of the private club represented by the Adventurer's Club, but a private space, and that is just what Imagineering has done. 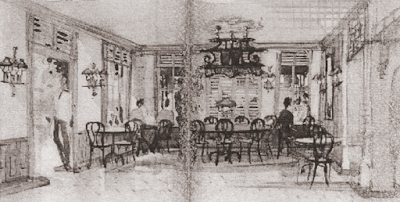 They've made the Canteen into a converted home, even turning one of the side rooms into a family dining room with a fireplace and cabinets of fine china. 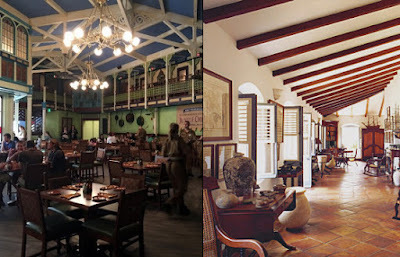 The Explorer's Club, also known as Colonel Hathi's Pizza Outpost at Disneyland Paris, is another space which is at once exotic and evokes domesticity, with soaring ceilings and shaded verandas. I'd rather have it that way, too. The approach is simple and matches the tone of what's there in the park already. One of the distinctive things about Disneyland and The Magic Kingdom, I feel, is that in many areas the theming is actually dead simple. 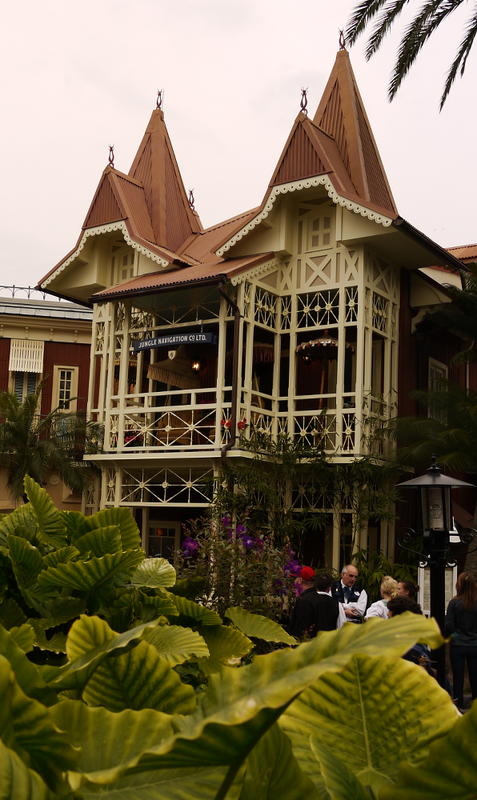 There's nothing inherently fabulously elaborate about the Columbia Harbour House or the French Market, but they're persuasively alive in the ways that some more modern Disney themed establishments feel more cluttered up with stuff than actually carefully themed. And that's why I applaud what Imagineering did with the Skipper Canteen. It isn't just about reopening a space and keeping it true to its original intentions, it's about knowing when to stop. It's a problem that pops up more and more these days, as Walt Disney World sees more and more visitors and more and more projects put through the sausage factory. It's reassuring that the designers of the Canteen saw the value in the intended design, and knew that sometimes that was enough. 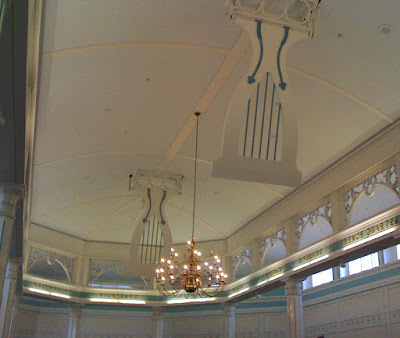 And that a brilliant, historically valid original Magic Kingdom interior was repurposed and reopened to the general public is even more cause to celebrate. Excellent, thought-provoking article as always! Thanks so much for posting it! The problem here is one of tonal mismatch. 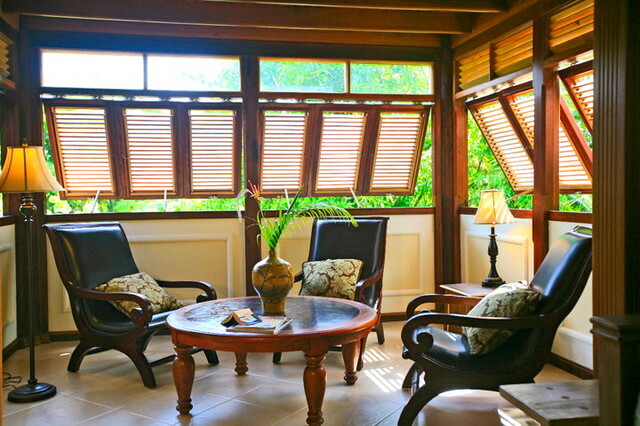 The Veranda might be perfectly appropriate chronologically, geographically, etc. But it is absolutely incorrect tonally. Naming something after the Jungle Cruise suggests JUNGLE - rustic, makeshift, edge-of-civilization-and-civilization-isn't-winning kind of stuff. Even "canteen" suggests a campsite. What's more, tonally, the Jungle Cruise (and arguably Adventureland as a whole) is over-the-top, campy, kitschy, even outrageous! Animal Kingdom might be all about the respectful authenticity - Adventureland is a random hodgepodge designed to communicate exoticism, mystery, and humor. 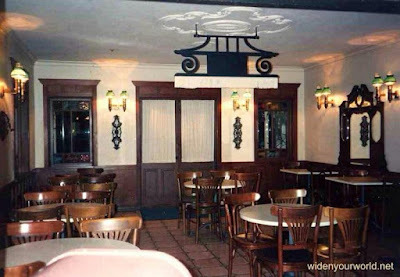 When some people (like me) hear that a restaurant is supposed to be themed after the Jungle Cruise, we go in expecting Marc Davis, not Dorothea Redmond. Against that set of expectations, her lovely design just seems bland. Would any Imagineer building a "Skipper Canteen" from the ground up with a large budget set it in a tasteful French Colonial manor house, beautiful and evocative as it is? Highly doubtful. 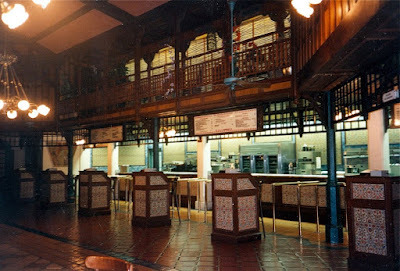 The whole restaurant suggests that Disney was simply trying to get as much table service seating in the Magic Kingdom as possible, and therefore quickly resurrected an unused space, layering on some light Jungle Cruise theming in the form of waiter spiels, wall hangings, and pun menu names in an effort to give the restaurant some kind of "hook." Tonal mismatch is inevitable. 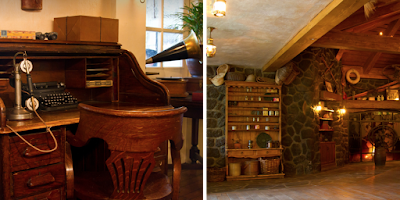 It's true that a lot of people have been moaning the lack of "artifacts on the walls." It's easy to dismiss these people out of hand, as artifacts can lead to TGI Fridays just as easily as they can lead to the Adventurer's Club (which I'd never been to). But one shouldn't dismiss the underlying PROBLEM just because the proffered SOLUTION isn't any good. The expectations mismatch is real. A Jungle Cruise restaurant suggests a themed experience far closer in character to the immersive, in-your-face 50's Prime Time Cafe or Sci-fi Dine-In, and the current Skipper Canteen doesn't deliver that. Wonderful post! 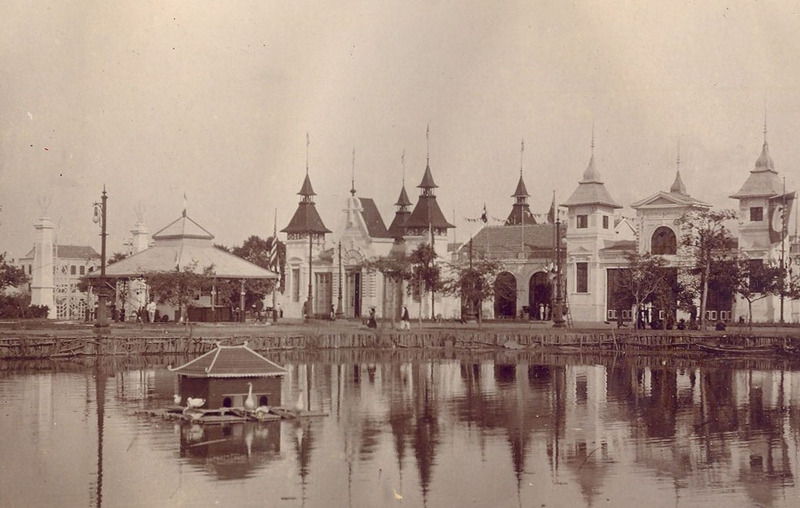 I'll be looking at Adventureland in a different way on my next visit, thanks to this essay. 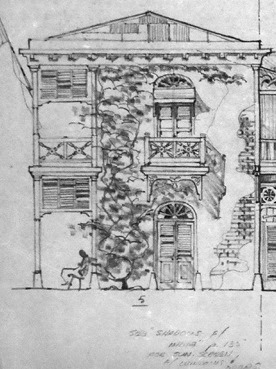 A most interesting over view of the design and architecture of the Veranda. thank you. 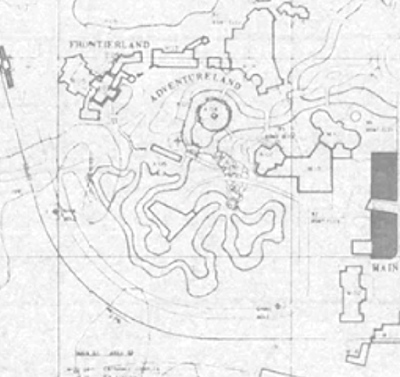 Have you done something similar covering the Adventurer's Club of Pleasure Island? if so I could not find it. if you have written something on the topic perhaps a link in this article to it if it exists? 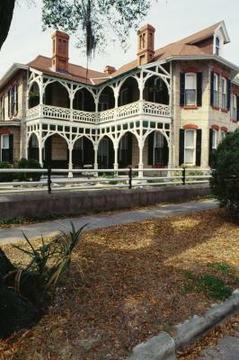 First I would like to say, you have done a remarkable bit of research on the Veranda! I vaguely recall what it looked like when I was younger and the sketches brought back old memories. Now, my only discrepancy is that The Jungle Navigation Co. LTD Skipper Canteen is indeed connected to The Adventurers Club. 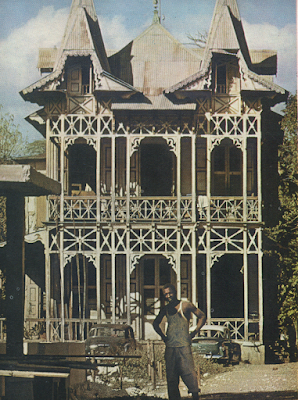 Albert Falls, founder of the The Jungle Navigation Co. and builder of the Canteen was a member of The Society of Explorers and Adventurers (S.E.A.) and had a hidden room for S.E.A. Meetings installed behind the bookshelves in the main Mess Hall. In the cabinets that line the entrance to the room are S.E.A. Member fezzes and among such noted names as Lord Henry Mystic and Capt. Mary Oceaneer is the Fez of Merriweather Adam Pleasure, founder of Pleasure Island and the Adventurers Club. 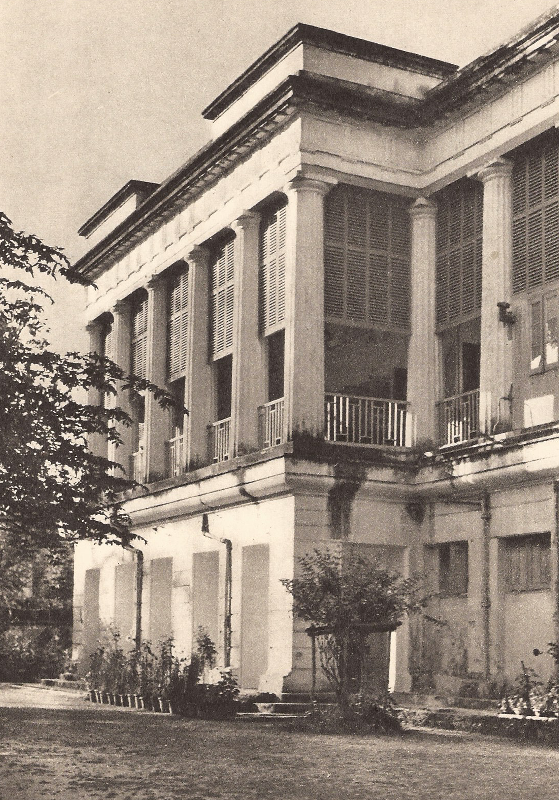 However, with Albert's passing in 1930, his granddaughter, Alberta took over the Company and not being interested in S.E.A. Membership, opened the secret room to the public. 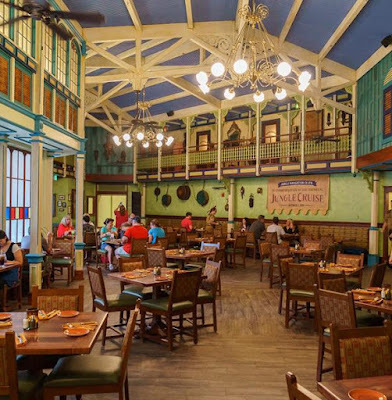 Also, when the Canteen opens in the morning, The Skippers gather in a rousing round of "The Adventurers Club All Purpose Theme Song" and one of the desert items on the menu is the Kungaloosh (though it is a chocolate cake and not the adult beverage we all enjoyed). Your thoroughness never ceases to astonish me. Though I am unsure of my willingness to agree with your conclusion, your ability to break down a themed area through its architecture and influence in order to reveal intention is truly amazing. I will never forget what you said about Storybook Circus in your article, "Lightning in a Bottle? "- "One doesn't read Storybook Circus, she reads into it." This sentence encapsulates my affection for WED (especially when compared to WDI) and I have since tried to apply this way of thinking to my enjoyment and examination of themed spaces. Thank you for always pushing me to think in new ways. Keep up the great work! My own acquaintance with WDW is so fleeting that I really enjoy these sorts of breakdowns. So THAT'S what I was seeing when I was there! 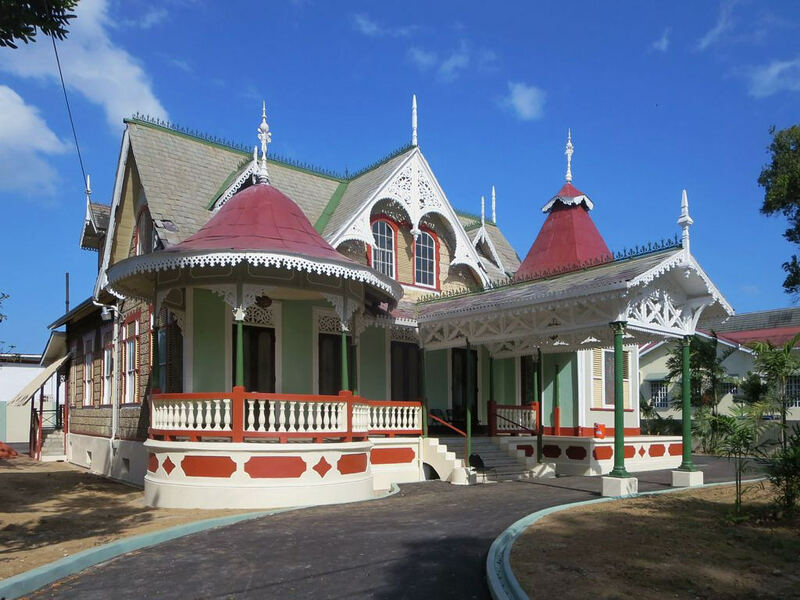 The clinic in colonial architecture is also very welcome. 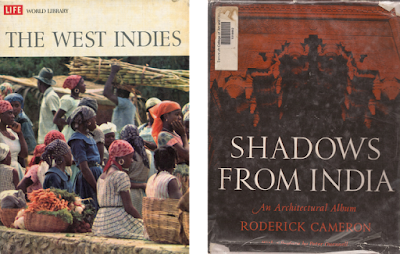 "It gets into tricky territory if you want to claim that Hawaii was ever "colonized" - issues that a Disney blog and this unlearned author would be best to avoid." Loved the references to the original source materials, fantastic research! Great Investigative work Chris! (isn't it fun!?) Very intriguing read! 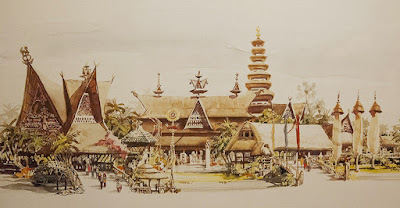 I was aware of several of WDW's Adventureland structures design influences from a series of articles I had written many years ago for a Disney in-house publication -the series was called "The Inspiration Behind the Imagination" ......however after the first articles were finished, management at the time felt it made it look like WED-WDI was just copying things for the parks and decided not to published them. Chris I so strongly agree with you : so much of original WED designs didn't rely so heavily on over done painting schemes and "theme clutter". This is used by many Imagineers today who are trying to disguise POOR DESIGN - or today especially HORRID-REHABS. This comes from a generation of designers who grew up on all those early HGTV home reno shows and Interior design swaps where an entire 4 bedroom home has to be renovated in three days or neighbors have to landscape their neighbor's yard while they are out at diner. Or shows that tell you to not be afraid to repaint a 4 room house 27 different colors of paint to make it "pop" ;sponsored by a paint company of course!! 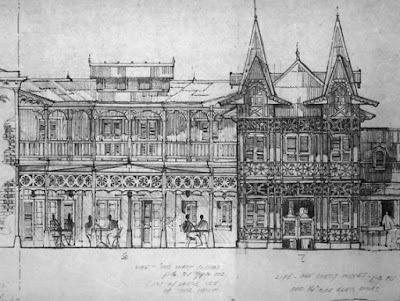 (this gives us a Disneyland Main Street USA and a Liberty Square that looks like a giant Polly-Pocket Plastic Play set) Imagineer's like Bill Martin, Sam McKim, Herbert Ryman and especially Dorothea Redmond new how to design things with dignity and class, and when appropriate something whimsical. Their environments were Fantasy or settings the way people wished they were or expected them to be and they seemed like they could be real places! WED Imagineers worked so very hard to create "lands" like New Orleans Square, Adventureland and Caribbean Plaza to be grand multi-course meal and today these places are being turned into a microwave burrito and 15 courses of dessert - that we walk away from with a stomach ache! Wait--did I go off the subject?? Visited MK yesterday & ate at the canteen. The friend I was with told me you had just published a new article. Very timely for me. Thanks so much for all your work and research. It adds immensely to my enjoyment of the park! Outstanding article ! Thanks for the research & care put into it. "they're persuasively alive in the ways that some more modern Disney themed establishments feel more cluttered up with stuff than actually carefully themed." This really ring a bell. Here in DLP, we lost the beautifuly crafted & story driven "Town Square Photography" to "New Century Notions Flora's Unique Boutique" which is a generic looking Victorian shop with a cluter of decorative objets on top of the shelves. It's the current rule for shops, think the HKDL Main Street shops. @Mike Cozart : "this gives us a Disneyland Main Street USA that looks like a giant Polly-Pocket Plastic Play set"
Damn. This was an amazing read. Just amazing. What a brilliant post again, as always. You're in-depth reviews and documentation is uncompared, and it's more than a pleasure to learn so much about what I love and about what I thought I knew everything about! 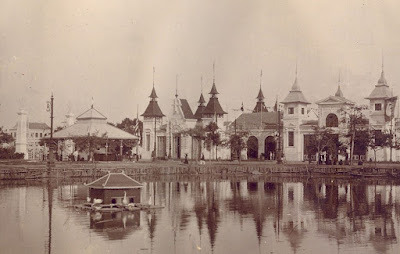 If there's one comment to make, I currently live in Vietnam and the picture you use to show the influence of Indochina on the architecture in Adventureland is not from the old quarter in capital city Hanoi. Instead this building can be found in the much smaller and more historic town Hoi An, around 800 kilometers (500 miles) down south of Hanoi. On this link the photo can be found with, with additional information about Hoi An at the bottom. 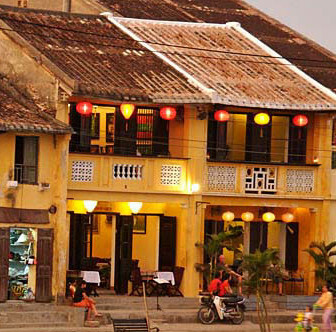 Also here you can find another picture of the same building on a promotional photo of Hoi An. But once again, thanks for all the effort you put into writing these essays. Looking forward to the next one. I do agree with Chris that the name of the new restaurant could be misleading. But I'm ecstatic to now be able to walk through the re-opened space, at all!